Couch Cleaning and is very important to remove the dirt and stains from regular wear and tear. Couch Steam cleaning is a very efficient and good choice for cleaning in an eco-friendly manner. Regular steam cleaning will also help in extending the life of your couches and sofa sets. Steam cleaning technology uses steam generated with water to carry out the cleaning in contrast to other chemical methods and hence is very safe. Some of the steam cleaning machines also permit the use of cleaning solutions which are sprayed along with water and enable efficient cleaning. Such cleaning sprays are generally considered when you want to get rid of any odour or stains on the couches. For general cleaning purposes, only steam jet is sufficient. Before carrying out any steam cleaning, first, check the care instructions for the furniture. If it is an S- code furniture, the fabric can be cleaned only with a solvent-based cleaner and steam cleaning cannot be employed in such cases. Couch steam cleaning is acceptable for products with a code W.
Just like you perform patch test for every cosmetic product on your skin, you need to perform a patch test for your couches as well to avoid any unwanted results. Perform cleaning on a small patch/area, preferably a hidden area. So, even if your couch gets damaged, only you can see it. Before steam cleaning, use a vacuum cleaner to remove any dust particles, pet hairs and other loose particles. 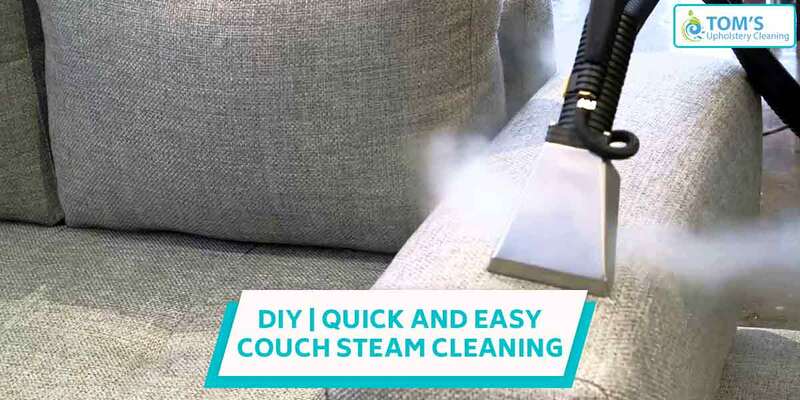 Direct use of steam might make loose particles to stick on to the surface of your couch. Prepare your cleaner by reading all the instructions first. The temperature must be at least 158 degrees Fahrenheit for sanitation and at least 212 degrees Fahrenheit for disinfecting the surface. While cleaning the couch surfaces move from upside surface making your way downwards. Take care and clean every small section as well. It typically takes 35-40 seconds to clean every patch. This is the last step, after cleaning, give time for drying before using the couch again. Though you can easily perform this task of couch cleaning easily on your own but for removing deep dirt stains and stubborn stains it is recommended to call experts for help who will definitely provide you with great services worth the prices you pay. To save yourself from all this hassle you can simply hire Toms couch cleaning professional anywhere across Melbourne and its suburbs by calling at 1300 068 194. We provide on-site, same-day services.